Background and Aims: At our institution there has been a dichotomous antimicrobial treatment behaviour for acute haematogenous osteomyelitis (AHOM) since 1984. The surgical department favoured fosfomycin as initial choice and the medical department β lactams. We aimed to compare the performance of both strategies. Methods: Data from patients discharged with the diagnosis of AHOM between January 1984 and January 1998 were gathered from the charts by means of a questionnaire. Patients receiving fosfomycin treatment (FT) were compared with those receiving fosfomycin plus other antimicrobials (FT+) and those receiving no fosfomycin treatment (NFT). Results: A total of 103 patients aged 0.1–15.5 years (mean 6.5, median 6.9) with AHOM received no surgical treatment initially. In 23 (22.3%) FT was instilled initially, in 47 (45.6%) FT+, and in 33 (32.0%) NFT. The pathogen was established in 30%, 36%, and 42% of FT, FT+, and NFT patients, respectively, Staphylococcus aureus being the predominant isolate. Mean C reactive protein levels and erythrocyte sedimentation rates normalised in all treatment groups after two and four weeks, respectively. The mean duration of intravenous antimicrobial treatment in FT patients was 2.5 weeks, in FT+ patients 3.1 weeks, and in NFT patients 3.8 weeks (p < 0.05), whereas the mean duration of intravenous plus oral treatment was comparable (7.1 v 6.8 v 6.5 weeks). Conclusions: The leucocyte penetrating fosfomycin performed similarly to extracellular β lactams in the treatment of AHOM. Intravenous treatment for longer than 2.5 weeks offered no advantage. A cute haematogenous osteomyelitis (AHOM) is a bacterial infectious disease which mainly affects the paediatric age group. In children the yearly incidence ranges between 1:5000 and 1:10 000.1,2 These relatively low figures hamper prospective antimicrobial treatment studies enrolling sufficiently large numbers of patients. Although Staphylococcus aureus is the most common identified causative agent,2 a further obstacle to establishment of best modalities of anti-infective treatment is the failure to detect the causative organism in more than 30–50% of cases of AHOM.3 Thus, since optimal antimicrobial treatment in terms of antibacterial compound, application route, and duration remains to be determined, treatment modalities for AHOM practised by different centres may vary considerably. At our institution, since 1984 the surgical and the medical departments have used different antimicrobial treatment regimens for AHOM. The surgical department favoured initial intravenous treatment with fosfomycin, and the medical department initial intravenous treatment with a β lactam antibiotic. This dichotomous prescription behaviour within the same centre offered us the unique opportunity to compare the performance of regimens containing fosfomycin, which penetrates leucocytes and shows activity against a broad spectrum of bacteria, versus regimens containing β lactams. Patients older than 1 month treated for osteomyelitis at the University Children’s Hospital of Zurich during the period January 1984 to January 1998 were identified by computer search for the in-house code of discharge diagnosis osteomyelitis. Only patients with community acquired AHOM and no primary surgical treatment were included in this analysis. AHOM was defined by a history shorter than two weeks and the presence of two or more of the following criteria: local signs of inflammation, radiological signs (deep soft tissue swelling, and/or periosteal reaction, and/or bone destruction), and/or isolation of a pathogen from tissue puncture or blood.4–6 Patients with concomitant arthritis, chronic osteomyelitis, or osteomyelitis following a penetrating injury or surgery were excluded. Patient data were gathered from their records, by means of a questionnaire containing items relating to demography, clinical signs, diagnostic investigations, treatment, clinical course, and outcome. Patients receiving fosfomycin treatment (FT) were compared with patients receiving FT plus other antimicrobial agents (FT+) and with patients receiving antimicrobial agents other than fosfomycin (NFT). For statistical comparison of the three treatment groups, the Mann-Whitney U test and the χ2 test were used. A p value <0.05 was considered statistically significant. Between January 1984 and January 1998 a total of 340 patients were discharged with the diagnosis osteomyelitis; 103 were included in the analysis as they fulfilled the criteria for AHOM, were beyond the neonatal age at onset of the disease, and were initially treated conservatively. The age range was 0.1–15.5 years (mean 6.5, median 6.9). FT was installed in 23 (22%) patients, FT+ in 47 (46%), and NFT in 33 (32%). Table 1 gives a synopsis of the patients’ characteristics with respect to demography, history, clinical signs and laboratory data on admission, and localisation of AHOM. Patients receiving FT were comparable with patients receiving FT+ or NFT, except that the lower limbs were involved more often in FT+ patients than in FT or NFT patients (91% v 43% or 58%; p < 0.001), and the mean body temperature on admission was higher in NFT patients than in FT patients (38.1°C v 37.5°C; p < 0.048) (table 1). Plain radiographs were performed in all patients. Pathological findings on admission were noted in 26% of FT patients, in 32% of FT+ patients, and in 12% of NFT patients. During the course no pathological radiological findings were recorded in 48% of FT patients, in 30% of FT+ patients, and in 30% of NFT patients. A bone scan was performed in 95% of FT patients, 96% of FT+ patients, and 94% of NFT patients. Increased uptake of 99mTc was found in 100%, 95%, and 90% of the patients, respectively. One FT+ patient and one NFT patient were subjected to computed tomography. Changes typical for osteomyelitis were seen in both. All FT patients (n = 2), FT+ patients (n = 2), and NFT patients (n = 4) undergoing magnetic resonance imaging showed signs consistent with osteomyelitis. A microbiological investigation was undertaken in 96 (93%) patients. In 38 (40%) of the 96 investigated patients cultures from blood, bone aspirate, or both grew bacteria. Bacterial growth was found in 28 (33%) of 85 blood cultures, in 15 (42%) of 36 cultured bone aspirates, and in three (15%) of 20 pairs of blood cultures and cultures from bone aspirate. Table 2 gives the results segregated by treatment group. A microbiological work up was performed in 96% of FT patients, 92% of FT+ patients, and 94% of NFT patients. Blood cultures were drawn in 61% of FT patients, 85% of FT+ patients, and 94% of NFT patients (FT v FT+, p = 0.03; and FT v NFT, p = 0.003) and were positive in 14%, 33%, and 42%, respectively (p > 0.05). Bone aspirates for bacterial culture were carried out in 44% of FT patients, 34% of FT+ patients, and 30% of NFT patients; cultures grew bacteria in 50%, 38%, and 40%, respectively (table 2). Staphylococcus aureus was the most frequently isolated bacterium in all treatment groups: 57% in FT patients, 65% FT+ patients, and 57% in NFT patients. Coagulase negative staphylococci were isolated from FT patients and FT+ patients and accounted in FT patients for 43% and in FT+ patients for 18% of the bacterial isolates. Other isolated bacteria included Streptococcus pyogenes, Haemophilus influenzae, Streptococcus pneumoniae, Brucella melitensis and Salmonella panama (table 3). All 23 FT and 47 FT+ patients received intravenous fosfomycin at a mean daily dose of 200 mg/kg. In the 47 FT+ patients fosfomycin was combined in 38 with flucloxacillin, in two with amoxicillin, in four with amoxicillin/clavulanic acid, in two with clindamycin, and in one with gentamicin. The regimen was switched once to other combinations in 11 of these patients and twice in two patients. The reasons were isolation of an organism resistant to fosfomycin (S aureus and coagulase negative staphylococci, once each), side effects (n = 5), poor clinical response (n = 3), and targeted treatment after identification of the causative organisms (n = 2). In one case the reason for switching could not be clarified. The intravenous antimicrobials prescribed to the 33 NFT patients were amoxicillin/clavulanic acid alone (n = 15) at a mean daily dose of 126 mg/kg or in combination with gentamicin (n = 2); flucloxacillin alone (n = 7) or combined with gentamicin (n = 5); amoxicillin plus gentamicin (n = 2); clindamycin (n = 1); or ceftriaxone plus gentamicin (n = 1). In eight of these patients antimicrobial therapy was switched: in six once, in one twice, and in one three times because of poor clinical response (n = 4), side effects (n = 3), susceptibility of the isolated bacteria (n = 2), or not stated (n = 3). Oral antimicrobials subsequent to fosfomycin were prescribed to 20 (87%) FT patients; these were clindamycin (n = 10), amoxicillin/clavulanic acid (n = 6), cefaclor (n = 2), or flucloxacillin (n = 2). In one patient clindamycin was switched to another antimicrobial because of side effects. Oral antimicrobials following intravenous treatment were prescribed to 42 (89%) of the FT+ patients; these were clindamycin (n = 34), amoxicillin/clavulanic acid (n = 5), flucloxacillin (n = 2), and flucloxacillin plus clindamycin (n = 1). The 27 (82%) NFT patients prescribed oral antimicrobials following intravenous treatment received amoxicillin/clavulanic acid (n = 9), flucloxacillin (n = 5), clindamycin (n = 4), amoxicillin (n = 3), cefaclor (n = 3), co-trimoxazole (n = 1), or penicillin (n = 1). The patient with AHOM caused by B mellitensis was treated with rifampicin and co-trimoxazole. The mean duration of intravenous antimicrobial administration in FT patients, FT+ patients, and NFT patients was 2.5 weeks, 3.1 weeks, and 3.8 weeks, respectively (p < 0.05 for all groups), and the mean duration of hospitalisation 3.4 weeks, 3.7 weeks, and 4.8 weeks, respectively (p < 0.05). The total mean duration of antimicrobial therapy in FT patients, FT+ patients, and NFT patients was comparable (7.1 weeks v 6.8 weeks v 6.5 weeks). Table 4 lists the side effects noted during antimicrobial therapy. Fosfomycin, flucloxacillin, and clindamycin were involved in the majority of cases. Responses to antimicrobial treatment and outcome. The responses to antimicrobial treatment were assessed by analysis of the values for C reactive protein (CRP) and erythrocyte sedimentation rate (ESR), respectively. Figure 1 presents the mean values for CRP and ESR. CRP values decreased from week 1 onwards and in a parallel fashion for the three treatment groups. By comparison, baseline mean ESR values in FT patients, FT+ patients, and NFT patients were comparable, increased by week 1 in NFT patients but remained at a similar level in FT patients and NFT+ patients, and thereafter showed a parallel decrease for the three treatment groups. Normal values for CRP and ESR were attained by all treatment groups after two and four weeks, respectively. One FT patient underwent secondary surgical treatment during hospitalisation to evacuate pus. C reactive protein level (A) and erythrocyte sedimentation rate (B) in patients with acute haematogenous osteomyelitis. Values are given as mean ± SD. The numbers indicate the number of patients from each treatment group investigated at a given time. Within four weeks after discharge, one FT+ patient and one NFT patient manifested localised clinical inflammatory signs, showed increased CRP and ESR, and were rehospitalised for additional antimicrobial treatment. Eventually, all hospitalised patients recovered without further sequelae. A similar efficacy of antimicrobial treatment of AHOM was observed in paediatric patients beyond neonatal age initially receiving the leucocyte penetrating antimicrobial fosfomycin and in patients initially receiving leucocyte non-penetrating antimicrobials—that is, β lactams. Moreover, intravenous antimicrobials for a mean of 2.5 weeks proved to be as safe as for longer periods. The majority of patients reported here were initially treated with fosfomycin. This compound, originally a fermentation product of Streptomyces fradae, S viridochromogenes, and S wedmorensis and now produced synthetically, is an organic phosphonate which interferes with bacterial cell wall synthesis by inhibiting phosphoenolpyruvate transferase and exhibits activity against a broad range of pathogens including those usually isolated in AHOM.12 The available formulation of the leucocyte penetrating compound13 is for intravenous application only and is licenced in Europe, Japan, Brazil, and South Africa, but not in the United States and Canada. There are only a few reports in the literature on the application of fosfomycin in AHOM.14,15 Our study provides for the first time data on the use of fosfomycin on a large scale. The decrease of the mean values for CRP and ESR in FT patients, FT+ patients, and NFT patients following antimicrobial treatment evolved in a parallel fashion and without any statistically significant differences between the three treatment groups. The CRP values normalised at least two weeks prior to the ESR values (fig 1). These results are in line with studies showing CRP to be a more sensitive tool to monitor the effectiveness of treatment of AHOM than ESR5,16 and suggest a similar efficacy of FT and NFT. The time to normalisation of CRP values (<20 mg/l) of two weeks following antimicrobial treatment in our study was one week longer than the periods reported when using intravenous treatment with a first generation cephalosporin or clindamycin,5 or oxacillin or ampicillin.16 Since our FT+ and NFT patients received antimicrobials similar to those prescribed in the quoted studies, one likely reason for the difference could be that we did not segregate the patients according to the severity of their illness.16,17 Nevertheless, as normalisation of ESR in effectively treated AHOM has been shown to occur after a mean of four weeks,6,8 the interpretation that the treatments reported here resulted in responses similar to the ones reported in the literature is justified. Patients receiving FT or FT+ were prescribed intravenous antimicrobials for a significantly shorter duration than patients receiving NFT. 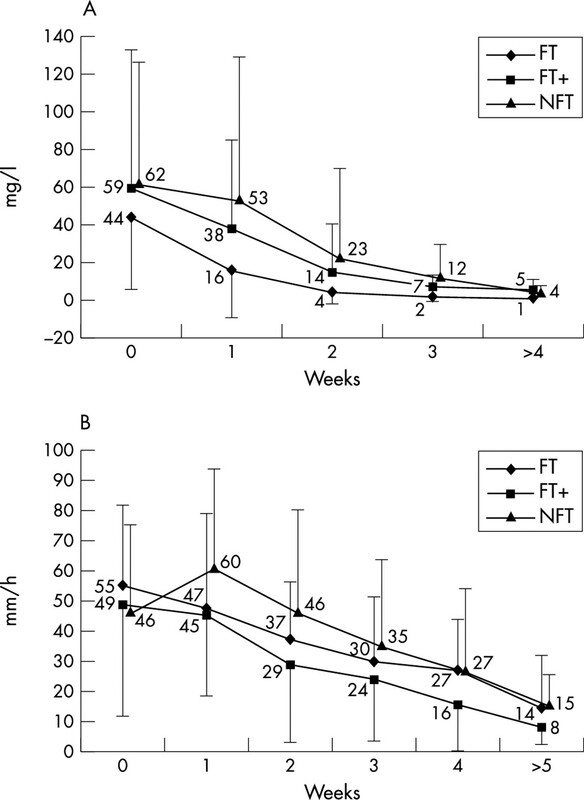 This was a result of the different treatment regimens entertained in the Department of Paediatric Surgery and the Department of Paediatrics, which was also the basis for a significantly shorter hospitalisation of FT patients and FT+ patients versus NFT patients (mean difference 1.4 weeks and 1.1 weeks, respectively). However, the mean duration of total antimicrobial therapy was similar in all three treatment groups and comparable with that reported by two of the other large studies.6,7 Antimicrobial treatment of AHOM used to be entirely intravenous administration for 4–8 weeks,9,10 but by the end of the 1970s sequential intravenous–oral treatment was starting to be advocated,11,18,19 and later became the accepted standard.6 The recommended duration of intravenous therapy ranges from 3 to 10 days and depends on whether surgical drainage was done and on the clinical response.11,18,20,21 More recently, a simplified treatment for staphylococcal osteomyelitis has been proposed by Finnish colleagues who, in a non-controlled study, switched intravenous therapy with a first generation cephalosporin or clindamycin to oral clindamycin, mostly within four days, with satisfying results.22 Our data from a unique cohort enabling comparison of different regimens did not fully support this extremely short intravenous regimen. However, we can conclude that initial intravenous therapy for 2.5 weeks was as effective as intravenous therapy for longer periods. Furthermore, normalisation of mean CRP values by two weeks in our large cohort of patients suggests that a mean duration of intravenous treatment of two weeks, followed by an oral regimen, could be safe. The optimal length of total antimicrobial treatment remains to be determined. Finally, administration of the leucocyte penetrating fosfomycin with a broad spectrum of activity resulted in no overt advantage over other antimicrobials, most of them leucocyte non-penetrating, except for a lower rate of side effects (table 4). This observation and the epidemiological findings of the present analysis and previous studies,1,2,4,6,22,23 that after the introduction of the conjugated vaccine against H influenzae type b in the early 1990s this pathogen is of no more concern as a potential cause of AHOM, and that S aureus is the main target in all paediatric age groups except in newborns, would support the general initial use of a narrow spectrum antimicrobial. Nevertheless, fine needle aspirates or biopsy specimens for Gram staining and cultures should be obtained before deciding on antimicrobial treatment as microbiological diagnosis remains a cornerstone for successful treatment. This is of particular importance for infants and toddlers with a negative history of H influenzae type b vaccination, for sickle cell anaemia patients who are prone to infections with Gram negative bacteria such as Salmonella spp., and for immunocompromised patients. In these patients a third generation cephalosporin, for example, ceftriaxone or cefotaxime should be administered if the results of Gram staining are inconclusive.24 For the intravenous treatment phase in other patients or patients shown to be affected by Gram positive cocci, flucloxacillin would seem more apt than clindamycin, which has a broader spectrum of activity. By contrast, based on the pharmacokinetics and pharmacodynamics, clindamycin would seem more appropriate for the oral treatment phase. As the rate of methicillin resistant S aureus isolates from the community is increasing,25,26 the future detection of such strains as a cause of AHOM seems likely. Thus, in agreement with the notion of a judicious use of antimicrobials, it is appropriate to reserve fosfomycin for such cases where its efficacy has been documented.27,28 As a result of this study, both departments at our institution have implemented the above described prescription policy for the treatment of AHOM beyond the neonatal age—that is, start with intravenous flucloxacillin followed by oral clindamycin except for the above outlined special conditions. Dahl LB, Hoyland AL, Dramsdahl H, et al. Acute osteomyelitis in children: a population-based retrospective study 1965 to 1994. Scand J Infect Dis1998;30:573–7. Maxson SDT. Acute hematogenous long-bone osteomyelitis. Semin Pediatr Infect Dis1997;8:220–33. Nelson JD. Acute osteomyelitis in children. Infect Dis Clin North Am1990;4:513–22. Bonhoeffer J, Haeberle B, Schaad UB, et al. Diagnosis of acute haematogenous osteomyelitis and septic arthritis: 20 years experience at the University Children’s Hospital Basel. Swiss Med Wkly2001;131:575–81. Unkila-Kallio L, Kallio MJ, Eskola J, et al. Serum C-reactive protein, erythrocyte sedimentation rate, and white blood cell count in acute hematogenous osteomyelitis of children. Pediatrics1994;93:59–62. Karwowska A, Davies HD, Jadavji T. Epidemiology and outcome of osteomyelitis in the era of sequential intravenous-oral therapy. Pediatr Infect Dis J1998;17:1021–6. Scott RJ, Christofersen MR, Robertson WW Jr, et al. Acute osteomyelitis in children: a review of 116 cases. J Pediatr Orthop1990;10:649–52. Faden H, Grossi M. Acute osteomyelitis in children. Reassessment of etiologic agents and their clinical characteristics. Am J Dis Child1991;145:65–9. Dich VQ, Nelson JD, Haltalin KC. Osteomyelitis in infants and children. A review of 163 cases. Am J Dis Child1975;129:1273–8. Mollan RA, Piggot J. Acute osteomyelitis in children. J Bone Joint Surg Br1977;59:2–7. Tetzlaff TR, McCracken GH Jr, Nelson JD. Oral antibiotic therapy for skeletal infections of children. II. Therapy of osteomyelitis and suppurative arthritis. J Pediatr1978;92:485–90. Neuman M. Recent developments in the field of phosphonic acid antibiotics. J Antimicrob Chemother1984;14:309–11. Hoger PH, Seger RA, Schaad UB, et al. Chronic granulomatous disease: uptake and intracellular activity of fosfomycin in granulocytes. Pediatr Res1985;19:38–44. Fernandez-Valencia JE, Saban T, Canedo T, et al. Fosfomycin in osteomyelitis. Chemotherapy1976;22:121–34. Guggenbichler JP, Bonatti H, Rottensteiner F. [Resistance of staphylococci to intracellular killing by macrophages—a new pathophysiologic concept of acute hematogenous osteomyelitis in childhood and its therapeutic consequences]. Padiatr Padol1989;24:21–32. Roine I, Faingezicht I, Arguedas A, et al. Serial serum C-reactive protein to monitor recovery from acute hematogenous osteomyelitis in children. Pediatr Infect Dis J1995;14:40–4. Roine I, Arguedas A, Faingezicht I, et al. Early detection of sequela-prone osteomyelitis in children with use of simple clinical and laboratory criteria. Clin Infect Dis1997;24:849–53. Kolyvas E, Ahronheim G, Marks MI, et al. Oral antibiotic therapy of skeletal infections in children. Pediatrics1980;65:867–71. Bryson YJ, Connor JD, LeClerc M, et al. High-dose oral dicloxacillin treatment of acute staphylococcal osteomyelitis in children. J Pediatr1979;94:673–5. Jackson MA, Nelson JD. Etiology and medical management of acute suppurative bone and joint infections in pediatric patients. J Pediatr Orthop1982;2:313–23. Nelson JD, Bucholz RW, Kusmiesz H, et al. Benefits and risks of sequential parenteral—oral cephalosporin therapy for suppurative bone and joint infections. J Pediatr Orthop1982;2:255–62. Peltola H, Unkila-Kallio L, Kallio MJ. Simplified treatment of acute staphylococcal osteomyelitis of childhood. The Finnish Study Group. Pediatrics1997;99:846–50. Unkila-Kallio L, Kallio MJ, Peltola H. The usefulness of C-reactive protein levels in the identification of concurrent septic arthritis in children who have acute hematogenous osteomyelitis. A comparison with the usefulness of the erythrocyte sedimentation rate and the white blood-cell count. J Bone Joint Surg Am1994;76:848–53. Vazquez M. Osteomyelitis in children. Curr Opin Pediatr2002;14:112–15. Frank AL, Marcinak JF, Mangat PD, et al. Community-acquired and clindamycin-susceptible methicillin-resistant Staphylococcus aureus in children. Pediatr Infect Dis J1999;18:993–1000. Fergie JE, Purcell K. Community-acquired methicillin-resistant Staphylococcus aureus infections in south Texas children. Pediatr Infect Dis J2001;20:860–3. Lau WY, Teoh-Chan CH, Fan ST, et al. In vitro and in vivo study of fosfomycin in methicillin-resistant Staphylococcus aureus septicaemia. J Hyg (Lond)1986;96:419–23. Utsui Y, Ohya S, Magaribuchi T, et al. Antibacterial activity of cefmetazole alone and in combination with fosfomycin against methicillin- and cephem-resistant Staphylococcus aureus. Antimicrob Agents Chemother1986;30:917–22.